4.1 What is an organized point cloud? 5.1 What is a brick map? The purpose of this application note is to provide recipes and examples for baking and reusing general 3D textures in Pixar's RenderMan (PRMan). The approach described herein is general and can be used to bake data such as diffuse color, highlights, direct and indirect illumination, ambient occlusion, etc. 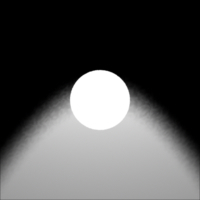 The primary example used below is baking light from an area light source; the light illuminates a simple scene consisting of a cylinder and a plane. 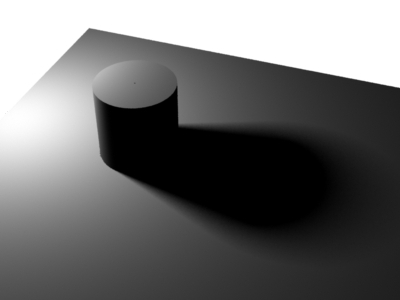 Since the soft shadows from an area light source are rather slow to compute, it is appealing to compute and bake it only once and then reuse it for many subsequent renderings. In another example, we bake illuminated surface colors. The displaychannels parameter is a string consisting of a comma-separated list of channel names. Each channel name must be specified in the RIB file. The corresponding displaychannels is the string "direct,onebounce,occlusion". If N is (0, 0, 0) the data points are considered spheres instead of oriented disks. When the optional parameter "radius" is omitted, PRMan automatically computes a radius that corresponds to the size of a shading micropolygon. If the radius is set to 0, the data are considered infinitely small points instead of disks (or spheres). When "interpolate" is 0, the actual points P are baked. This can result in "overlapping" points at shading grid edges. If "interpolate" is 1, the point positions, normals, radii, and data are interpolated from four shading points. This can be used to bake out micropolygon midpoints rather than the actual shading points, to avoid overlapping points at shading grid edges. Attribute "dice" "rasterorient" 0   # view-independent dicing ! Sides 1   # to avoid flipping normals in "spherelight"
It also generates two point cloud files: area_illum_plane.ptc and area_illum_cyl.ptc. The point cloud files can be displayed with the ptviewer program. These two point cloud files contain 170,000 points and 31,000 points and take up 5.4 MB and 1 MB, respectively. 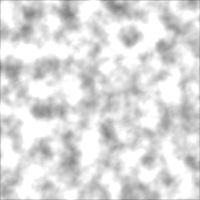 (If "interpolate" is set to 0 in the bake3d() call, the resulting point cloud files contain 200,000 and 36,000 points.) The number of points generated can be adjusted by changing either the shading rate or the image resolution. As in the previous example, the point cloud files contain 170,000 points and 31,000 points, respectively. In these examples, we have chosen to bake into a separate point cloud for for each object. We could also have chosen to bake all points into a single point cloud file. 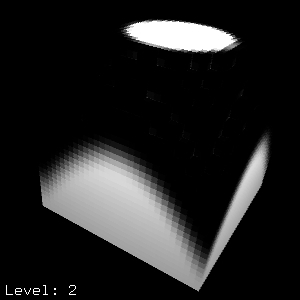 Shaders execute at the ray hit points if ray tracing is used to compute reflections, refractions, semitransparent shadows, or soft indirect illumination. 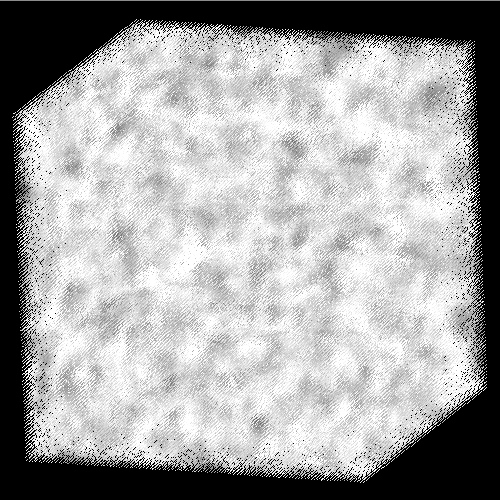 If the shader calls bake3d() at those hit points (in addition to the regular REYES grid shading points), the point cloud will end up with both regularly spaced points from the REYES shading grids and irregularly scattered points from ray hits. Depending on the curvature of the geometry that shoots the rays, the data points from ray hits will have very different radius values associated with them, and their radii will also be very different from the data points from REYES grids on the same surface. This precaution is particularly important if we intend to use the point cloud to generate a brick map (as discussed in section 4) since brick map construction works best for point clouds with data points that are regularly spaced and with consistent radii. If N is (0,0,0), the normals associated with the data points are ignored for the lookups. Rendering this image is very fast, and it is nearly identical to the image rendered during baking. When an unorganized point cloud is accessed the entire point cloud file is read in - even if only a few points are used. The entire point cloud stays in memory until the frame has finished. The point cloud format does not provide a level-of-detail representation, making filtering and blurring difficult. To overcome these limitations, we use two other data formats: organized point clouds and brick maps. With standard point clouds, the entire point cloud has to be read in by texture3d() and all the points stay in memory until the frame is rendered to completion. In order to handle large point clouds more efficiently, RenderMan Pro Server 14.0 introduced a new file format: organized point cloud. We recommend, but do not require, using the .optc suffix for organized point clouds. The organized points can be displayed with ptviewer, and information about the number of nodes and their data types can be obtained with ptviewer -info or -onlyinfo. The point cloud is organized if the listed number of tree nodes is larger than zero. The texture3d() function reads the points and octree nodes from an organized point cloud on demand, and caches them in a fixed-size cache. An organized point cloud is passed to texture3d() with the filename parameter (just like unorganized point clouds). The difference is that texture3d() can lookup texture data in an organized point clouds without loading the entire point cloud. Known limitation: texture3d() can't handle gzipped organized point cloud files (but it can read gzipped unorganized point cloud files without problems.) If texture3d() reads a gzipped organized point cloud, a warning message will be printed, and the point cloud will be treated as if it were unorganized. When points and octree nodes are read by texture3d() they are stored in caches. This makes it possible to efficiently read data from very large organized point cloud files. As usual, the Option overrides the rendermn.ini setting if both are used. However, the specified cache sizes are only used as a guideline. The number of cache entries is determined by the cache size and the number of data per point in the first point read. If any of the following points have more data, the point cache entries will be enlarged on-the-fly, and the end result is a cache using more memory than specified by the option (or rendermn.ini file). This also applies to the octree cache. To further confuse the issue, in multithreaded execution there are caches for each thread, so the total cache size increases as more threads are used. Sometimes increasing the cache sizes can speed up rendering significantly. You can determine if this is might be worthwhile to try by inspecting the statistics under the point/octreeCache tab. The first warning sign is if a significant part of the overall render time is spent in system calls (reading points and octree nodes from disk). The second warning sign is if the cache miss rates (e.g. Point cache misses / Point cache lookups) is above a few percent. (Due to compulsory cache misses, the rate will never reach 0 no matter how large the cache is.) If these warning signs are seen, there is a good chance that increasing one or both cache sizes will speed up rendering. 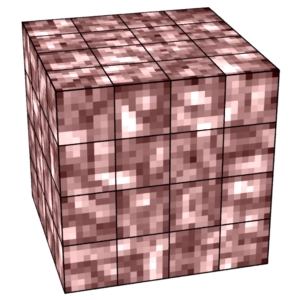 In order to facilitate efficient rendering of large sets of baked data it is necessary to convert the unordered point clouds to a MIP map representation suitable for efficient filtering and caching. 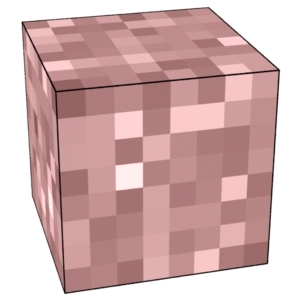 We use brick maps for this. 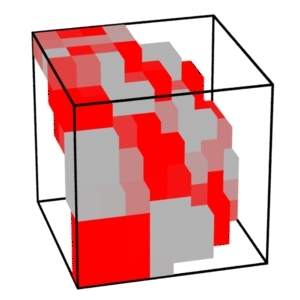 A brick map is an adaptive, sparse octree with a brick at each octree node. A brick is a 3D generalization of a texture tile; each brick consists of 8^3 voxels with (possibly sparse) data values. The data can be colors, such as diffuse color, specular color, illumination, shadow, etc., and/or floats, such as ambient occlusion, etc. 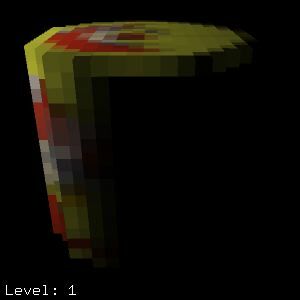 The brick map format is a 3D generalization of Pixar's tiled 2D MIP map texture format for normal 2D textures. 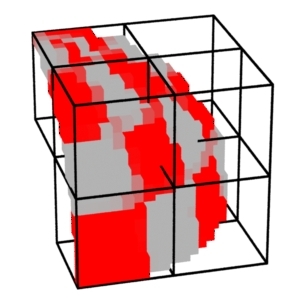 The brick map is independent of the surface representation. The MIP map representation is suitable for efficient filtering, and the tiling makes it ideal for caching. This means that PRMan can deal efficiently with large brick maps - even collections of brick maps much larger than the available memory. The user can specify the required accuracy when the brick map is created. This makes it simple to trade off data precision vs. file size. For this example, the resulting brick maps contain approximately 4100 and 1700 bricks and use 2.8 MB and 1.3 MB, respectively. Maxerror is a trade-off between precision and file size. Using a negative value for maxerror means that no data will be reduced/compressed. For very small values of maxerror (for example 0.0001) only very uniform data (as on the black side of the cylinder) will be compressed. The default value for maxerror is 0.002 which corresponds roughly to half of 1/255. Maxerror values of 0.001 to 0.01 are good to use in practice for data values in the [0,1] range. Maxdepth specifies the maximum depth of the brick map octree. The default value is 15, which usually has no effect. Here are a couple of screen shots of brickviewer in action. Both images show level 1 of the cylinder brick map. The left image shows the default display mode, where the faces of each voxel are shown. The right image shows the fast display mode where each voxel is shown as one square facing the screen. s switches between fast (approximate) and nice ("slow&") display mode. left/right arrows adjust point size in approximate mode. 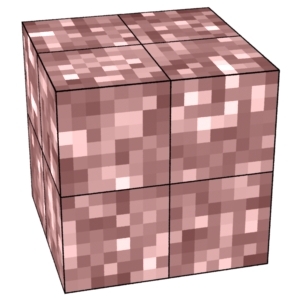 When the optional parameter "filterradius" is omitted, PRMan will automatically compute a filter radius that corresponds to the size of a shading micropolygon or the finest resolution in the brick map, whichever is largest. The variables can be read in a different order than the order they were baked in. It is also possible to read only a subset of the baked variables. Rendering this image takes less than 10 seconds. It is nearly identical to the image rendered during baking. Notice that the voxels are large in areas with uniform color and small in regions with sharp details. As mentioned previously, PRMan will automatically compute a filter radius that corresponds to the area of a micropolygon (or the finest resolution in the brick map). But the filterradius can also be explicitly set in order to blur the lookup results. Filterradius is measured in world space units. The images below show two examples corresponding to "filtersize" 0.03 and 0.1. It is interesting to note that, although the textures are blurred in most regions, the color contrast across the sharp edge of the cylinder is still sharp. This is because the brick map data are stored in separate octrees depending on the orientation. In order to ensure smooth transitions between different lookups (for example in a zoom out of a scene), the lookups can be linearly interpolated between two levels in the brick map. This is specified by setting the optional parameter "lerp" to 1. The default is 0. The default brick cache size is 10 MB (same as above). As usual, the option overrides the .rendermn.ini setting if both are specified. The specified brick cache size is only used as a guideline. The number of cache entries is determined by the cache size and the number of data pr. voxel in the first brick read in. If any of the following bricks have more data pr. voxel, the brick cache entries will be enlarged on-the-fly, and the end result is a brick cache using more memory than specified by the option (or rendermn.ini file). To further confuse the issue, in multithreaded execution there is a brick cache for each thread, so the total brick cache size increases the more threads are used. 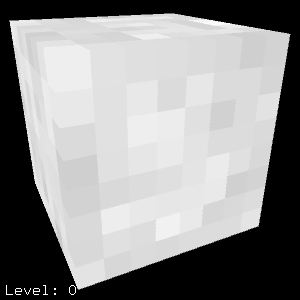 Sometimes increasing the brick cache size can speed up rendering significantly. You can determine if this is might be a worthwhile endeavor by inspecting the statistics. The first warning sign is if a significant part of the overall render time is spent in system calls (reading bricks from disk). The second warning sign is if the brick cache capacity miss rate (ie. 'Capacity cache misses' / 'Brick cache lookups') is above a few percent. (The brick cache compulsory miss rate, 'Compulsory cache misses' / 'Brick cache lookups', is due to the first read of each brick, and that rate will not change no matter how large the cache is.) The third warning sign is if the 'brick read time' statistic is a large fraction of the overall render time. If all three warning signs are seen, there is a good chance that increasing the brick cache size will speed up rendering. The default number is 64. When the number of open files exceeds this value, the least recently used file will be closed. Normals are disambiguated at all levels of the brick map. So it is perfectly fine to bake data from double-sided shading into a single brick map, and data can be looked up with wide filters without getting data that are mixed from front- and back-sides. The correct surface normal must be used, otherwise the lookups will fail. In this section, we'll bake and lookup volume data: a smoke texture and volume illumination inside a cubic volume. When baking and looking up volume data it is important to use a "null" normal, i.e. N = (0,0,0), to distinguish the data from surface data. In addition to writing the point cloud file, the shader also generates an image of the deepest slice of the smoke (the last assignment to Ci). The following RIB file renders a 2x2x2 volume and bakes out a dense 3D point cloud file called smokevol.ptc. Display "Baking volume texture data: smoke density" "it" "rgba"
Running this RIB file renders the following image. The image shows the smoke density at the back wall. In this example, we bake the illumination and shadow in a volume (again using ray marching). The illumination is stored as a color. The RIB file contains a spot light, a sphere casting a shadow, and a volume. Display "Baking volume illumination" "it" "rgba"
Running this RIB file renders the following image. 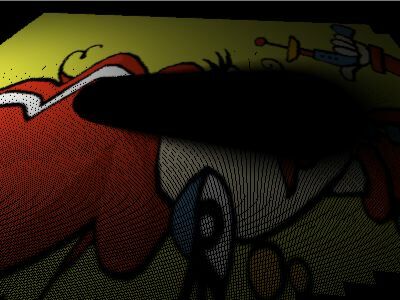 The image shows the illumination at the back wall, a slice through the spotlight cone. 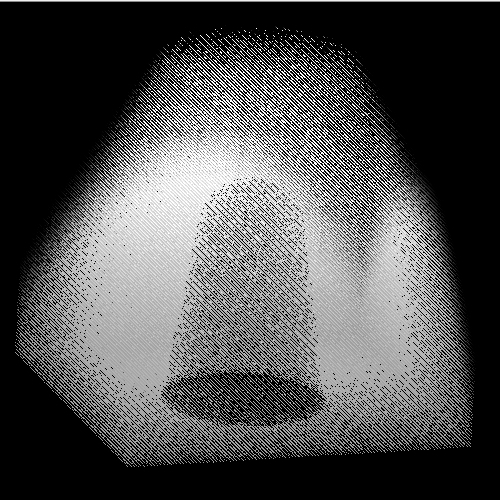 The noise along the edge of the spotlight cone is caused by the random jitter in the ray marching start position. In these examples, the volume point cloud was baked from a volume shader in PRMan. It is also possible to generate volume point cloud files using other applications than PRMan via the point cloud file API described in Section 8. Display "Reading volume illumination and smoke density" "it" "rgba"
The rendered image shows the sphere and illuminated smoky volume. Ensure that there are no lookups outside the original volume of the data points. Bake additional data points around the original volume. These data should have "neutral" values such as e.g. black color, zero opacity, zero smoke density, etc. If both density and illumination were baked into the same brick map, only half as many lookups would be necessary, and the run time would be faster. In the previous example, reading the baked data is not significantly faster than computing the data from scratch. However, some data are more time-consuming to compute, while the lookup time is independent of how long it took to compute the data to begin with. We have made the simplification that the illumination does not depend on the smoke density between the light source and the illuminated points. If we wanted to compute more accurate illumination, we must ray march through the volume, looking up smoke densities along the way. There are two ways of doing this: the slow way and the fast way. The slow way: At each point we wish to compute the illumination, we can ray march through the volume between the light source and the point, accumulating smoke densities along the way. This is an order O(n^2) algorithm, with n being the number of points (more than 1 million in this example). 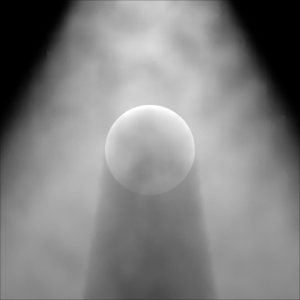 The fast way: It is much more efficient to change the ray marching direction: ray march from the light source through the volume, accumulating the densities along the way and baking the attenuated illumination. This is an order O(n) algorithm - much more manageable. The bake3d() and texture3d() functions have an optional parameter called "cachelifetime". 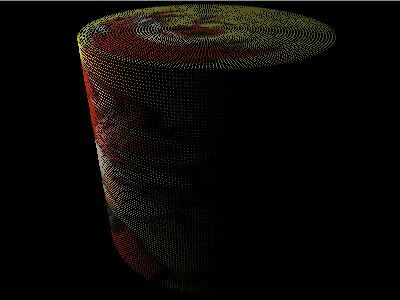 When "cachelifetime" is set, the data points are not written to a point cloud file, but are instead cached in memory. In this case, the "filename" parameter specifies the name of the cache instead of the name of a file. The values of "cachelifetime" can (currently) be "shadinggrid" or "frame". For "cachelifetime" "shadinggrid", the data are stored in a cache that lives on the shading grid. The cache is cleared when the grid has been shaded. This is mainly useful for sharing common computation results between multiple light source shaders being run to illuminate a surface, for reusing computation results from a displacement shader in a surface shader, and (if filterradius > 0) for sharing results between nearby shading grid points. The bake3d() and texture3d() cache lifetimes should of course be identical for a given cache name. We may add other cache lifetimes, for example, "bucket" or "object", in the future. NEW FUNCTION in PRMan 16.0: getpoints(). The getpoints function gets data from a specified number of nearest points in point cloud(s). The lookup region is specified by a filterregion for position and one for normals. The lookup routine is the same as for texture3d() lookups in point clouds, but instead of returning a weighted average of the point data, the "raw" point data are returned in arrays of data. If the normal filterregion parameter has normal (0,0,0), it indicates that we don't care about normals, and no points are rejected due to having a normal outside the normal filterregion. 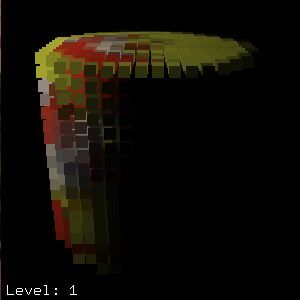 Among many other uses, this function can be used to do isotropic or anisotropic lookups in point clouds, with the shader applying filter weights for anisotropic blur. It can also get e.g. the position of the points in the shading grid that the current shading point is on. The example above reads data in the channel "mydata1" into the array called md1, and similar for "mydata2". The shader can then e.g. loop over the data in the arrays and compute weighted averages for smooth filtering. This example uses an anisotropic filterregion defined by the viewing angle of the surface at position P. For example, if the surface is seen at a grazing angle at P, then frP will be very elongated, resulting in points relatively close to P being excluded from the filterregion if they are to the side of P, but included if they are in front of or behind P.
It is also possible to ask for the special pre-defined data channels "_position", "_normal", and "_radius" even if those have not been explicitly stored in a bake3d() call. Current limitations for "cachelifetime" "shadinggrid": the order of the data channels has to be the same as in the bake3d() call, and the special pre-defined data channels "_position", "_normal", and "_radius" are not implemented. Be careful about baking at ray hit points! Baking at ray hit points can scatter additional data points in the point cloud, in addition to the regular data baked from REYES shading grids. The additional data points can have widely varying radius values. This is discussed in Section 2.3. Don't bake point clouds or brickmake over slow a network! When generating a point cloud or a brick map, write the resulting file to local disk (i.e. the disk associated with the computer doing the work) and then copy the final file across the network. This is faster than writing the file directly to a remote file location because the points and bricks are written in relatively small packets. 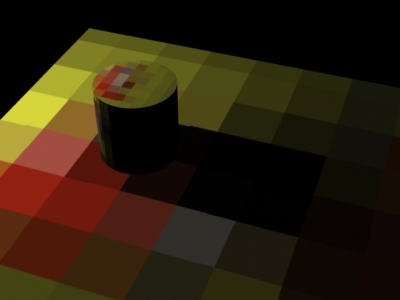 Q: Why don't you add a loop construct in RenderMan Shading Language (SL) that loops over nearby shading points? A: Only shading points on the same grid would be available during rendering, and this would be of limited use. For example, a shading point on the edge of a shading grid would be missing many of its immediate "neighbor" points. Q: Why don't you add a loop construct in SL that loops over all nearby points from a point cloud file (baked in a previous pass)? A: If only points within a specified radius were looped over, this would have limited use: for loops over baked points, one usually wants to not only to loop over the nearby points, but also some coarse representation of more distant points. Q: Why don't you add a loop construct in SL that loops over both nearby and distant points? A: For efficiency, the distant points need to be clustered together, otherwise the loops would be extremely slow. The algorithm for computing the coarse clustering representation of distant points depends on the application, so it must be programmable. This is beyond the scope of SL. We believe that for these types of computation, C and C++ are more suitable than SL. Writing a DSO that reads the point cloud (using the point cloud API) and computes a hierarchical representation is much more flexible. The subsurface scattering code in the application note "Translucency and Subsurface Scattering" is an example. Q: Why are there no API functions for writing data to a brick map? A: The reason is that this would be hard to do efficiently: if you insert data at one level in the brick map all other levels have to be updated accordingly. David DeBry, Jonathan Gibbs, Devorah DeLeon Petty, and Nate Robins. Painting and Rendering Textures on Unparameterized Models. David Benson and Joel Davis. Pixar Technical Memo 217, 1990. Per H. Christensen and Dana Batali. An Irradiance Atlas for Global Illumination in Complex Production Scenes. Rendering Techniques '04 (Proceedings of the Eurographics Symposium on Rendering 2004), pp. 133-141. PRMan's ambient occlusion and irradiance baking (that also uses point clouds and brick maps) is described in the Ambient Occlusion, Image-Based Illumination, and Global Illumination application note. The API for reading and writing point clouds is described in The Point Cloud File API. 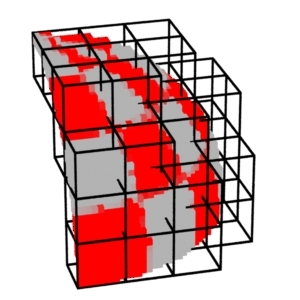 The API for reading brick maps is described in The Brick Map File API.